Storm Damage My son sent me this picture from his apartment building this morning after the storms. Overton Ridge Drive and Chisholm Trail Parkway in Fort Worth. 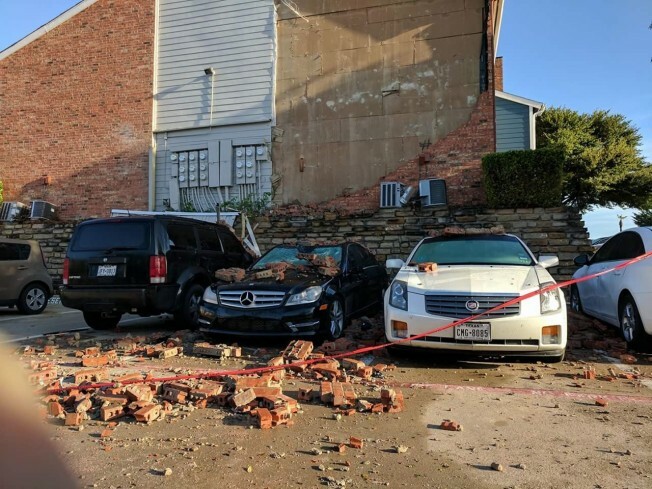 The National Weather Service confirmed Thursday afternoon they found evidence of a third tornado from Wednesday's storms, an EF-0 tornado in North Fort Worth. The latest tornado was confirmed to have touched down near U.S. Highway 287 and W. Bonds Ranch Road and was tracked to Texas 170 and Alta Vista. NWS survey crews said they will release more information about this tornado soon. On Wednesday, the NWS previously confirmed evidence of an EF-0 with wind gusts to 72 mph near the border of Watauga and Keller and an EF-1, with wind gusts up to 83 mph, in Lewisville. NWS survey crews said they found no evidence of a tornado in Rockwall, but did find evidence of straight-line winds up to 95 mph — the equivalent of an EF-1 tornado.